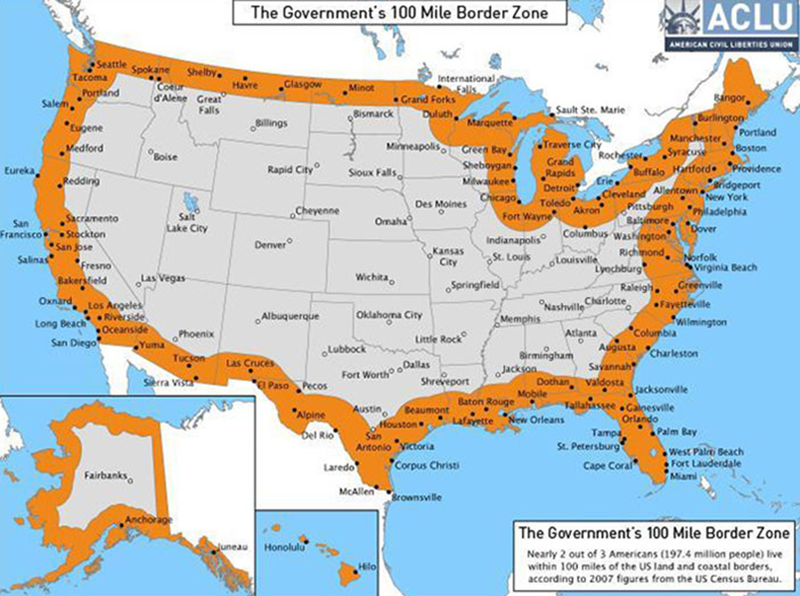 So long as the Border Patrol is doing it—up to 100 miles from a land or sea boundary. Donald Trump’s immigration crackdown recently has been playing out in an unlikely location: Greyhound buses. Over the past month, Border Patrol agents have been spotted boarding buses and questioning passengers about their immigration status—and, in some cases, even detaining them. In late January, one encounter went viral when onlookers recorded agents escorting a Jamaican woman off a Greyhound bus at a terminal in Fort Lauderdale, Florida. The woman had overstayed her tourist visa, US Customs and Border Patrol (CBP) said in a statement to the Miami Herald. She was in Florida to meet her granddaughter. In Washington state, an an 18-year-old DACA recipient and his father were asked on January 6 about their citizenship status on a Greyhound heading from Seattle to Montana, according to a local television station. The father, who was in the United States illegally, was detained. About a week later, a man in Maine contacted the state’s ACLU chapter after agents questioned him about his citizenship status when he boarded a Concord Coach bus. And, at the end of January, a man was detained on a different Greyhound bus at the same Fort Lauderdale station, the Miami Herald reported. CBP did not respond to questions from Mother Jones about whether there has been an increase in identification checks on buses. But Enoka Herat, of the ACLU of Washington, says there’s at least anecdotal evidence indicating an uptick in incidents since Trump’s 2017 executive order prioritized the deportation of all immigrants living in the United States illegally—not just those with criminal records. Herat notes that CBP’s power to question riders far from our nation’s borders stems from decades-old laws and policy: Legislation from 1946 gives agents the authority to search any vehicle near an “external boundary” of the United States, and subsequent regulations defined that area as within 100 air miles of a land or sea boundary. While that may sound like just a sliver of the United States, 9 of the country’s 10 most populated cities lie within the so-called 100-mile zone, and about two-thirds of Americans live inside of it, according to the ACLU. Ninety-seven percent of New Yorkers lived within the area in 2007, and some states, including Florida and Maine, are entirely inside it. Within the 100-mile zone, CBP agents can set up permanent and temporary checkpoints and have some ability to circumvent the Fourth Amendment, which protects against unreasonable searches and seizures, said Chris Rickerd of the ACLU’s national policy advocacy department. A 2015 report from the organization details the routine harassment of residents of border communities as they go about everyday activities, such as commuting to work, and the ACLU also has argued that enforcement within the 100-mile zone has led to racial profiling at courthouses and in hospitals. And it put immigrants and their families at risk during one of the largest natural disasters in recent United States history: When Hurricane Harvey hit Texas last August, CBP ignored precedent and said it would continue to enforce immigration laws at checkpoints along open highways, as residents fled life-threatening winds, rainfall, and flooding. But what about questioning bus passengers? Law enforcement officers typically aren’t allowed to stop someone unless they have reasonable suspicion. But, if it’s at a checkpoint, CBP says it can get around those restrictions. In an email to Mother Jones, an agency spokesman cited two high-court rulings that he said give CBP the right to conduct these sorts of immigration stops. A 1976 Supreme Court case gave agents the right to inquire about citizenship at permanent checkpoints, and a later decision found there wasn’t a substantial difference between a temporary and permanent checkpoint. The ACLU has argued that enforcement within the 100-mile zone has led to racial profiling at courthouses, in hospitals, and even along evacuation routes. Meanwhile, the ACLU of Maine is concerned enough about a potential policy change under Trump that it sent a public information request to CBP asking if the agency has issued a new directive, said Zach Heiden, the organization’s legal director. Heiden, Rickerd, and other advocates said they don’t see this type of harsh enforcement going away anytime soon.